UPDATE 9 November 2013: A new version of the film discussed below will be broadcast on Channel 4 in the UK on Sunday 10 November, at 8.00 pm. ’Tutankhamun: The Mystery of the Burnt Mummy’ focusses on the events surrounding the king’s death and burial, specifically the theories that he died in a chariot accident and that his mummy may have spontaneously combusted inside the tomb. I will post a few additional thoughts on this in a subsequent blog entry but what is below holds true for the project overall. 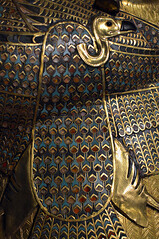 Notwithstanding the events in Egypt which have given us all such cause for concern in the last few days, I’ve also been quite excited lately because a film I made last year about Tutankhamun will be broadcast this week, first on the History Channel in Canada on Sunday, on PBS in the US on Wednesday, and on the National Geographic Channel in several other countries around the world including Australia, Germany, The Netherlands and the UK (Sat 13 July 8 pm BST). The film, ‘Tutankahmun Decoded’ / ‘Ultimate Tutankhamun’, focuses on the life, death, and Earthly afterlife of the famous boy-king. The central question we – myself, the production team, and our expert contributors – wanted to ask of the evidence was: how can it be that this young man, who reigned so briefly, came to be almost instantly and comprehensively forgotten for thousands of years until the discovery of his near-intact tomb made his name and image among the most recognisable of any figure from history? Tutankhamun has been with me for most of my life. I don’t exactly remember when my fascination with the king and his treasures began but it was already there by the time Christopher Frayling’s wonderful four-part BBC series, ‘The Face of Tutankhamun’, was broadcast in 1992 when I was fourteen years old. My mother recorded the series on VHS cassettes which we still have at home with her handwritten labels on the side. It had been there a year earlier when I tripped over a stray crash mat in the gym at school and landed on my chin. The resulting bruise looked like a little beard prompting a witty class mate to name-call ‘Tutankhamun!’. And everyone laughed. 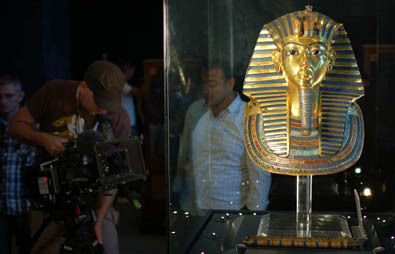 I never thought then that I would make a film about the real Tutankhamun. 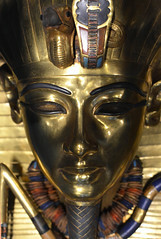 Tutankhamun in 2013: anything new to say? 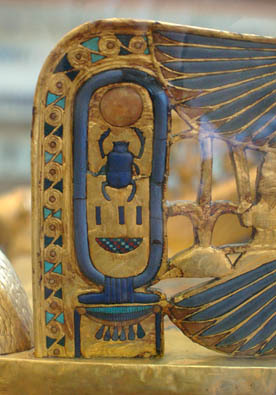 Egyptologists like me have been thinking a lot about Tutankhamun over the last year or two. 2012 was the 90th anniversary of Howard Carter’s discovery of the tomb and in recent years new research has opened up the discussion about his mummy and the cause of his death, in particular the CT scanning of the body in 2005 and the study of DNA from this and several other royal mummies, the results of which were announced in 2010. 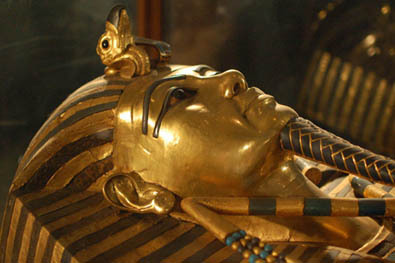 One other crucial factor was our knowledge that, contrary to what you might think, most of the material from Tutankhamun’s tomb has never been thoroughly studied and published, not even the death mask itself. A great deal yet to be said! It’s an interesting aspect of Egyptology, and no doubt of many academic fields, that not everything is published, and publication is only the last step in a long process that begins with the discovery of evidence and is then followed by meticulous recording (we are all familiar with the stereotype of the archaeologist carefully brushing the dust away from whatever has just been found) and perhaps years of study and research to establish context, parallels, significance etc. 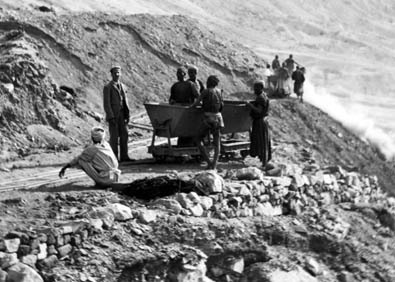 In the case of the treasures of Tutankhamun, the sheer scale of the discovery, the quantity of material, has so far defeated Egyptology. It would have been far too much for Carter to have published the material in his own; with hindsight his decision to publish a three-volume narrative overview of the discovery, The Tomb of Tut-Ankh-Amen, was perhaps the only sensible approach he himself could take. Efforts were made following the discovery to publish the material systematically according to object groups, originally by one the most influential figures in Egyptology, the great scholar, organiser and financial backer, Sir Alan Gardiner. Detailed studies have continued to emerge since (see the list, here) but only slowly, and the job is by no means finished. In such circumstances, as is the case with many unpublished archaeological excavations, we are forced to fall back on the notes, photographs, drawings and other documentation made at the time of the discovery. Here, Carter’s brilliance is clear. His records, now kept at the Griffith Institute in Oxford, are thorough and detailed, describing the objects recovered and their condition when found, but also the process – the challenges he and his colleagues faced in uncovering and removing everything safely, and the solutions they came up with to overcome them. His drawings are fine enough almost to be considered works of art in their own right, and the Griffith Institute has done us all an enormous service in making most of this material freely accessible online. Our intention with the film was to take a comprehensive look at the evidence and the results of recent studies, to go back to Carter’s records to see if there was anything further that needed investigation, and to provide a new overview of what we know. The result is, I hope, an entertaining new look at the story, and the great irony that the political circumstances of the times and the accident of a great environmental event meant that Tutankhamun was almost completely forgotten within a few years of his lifetime, going completely against the wish of every Egyptian ‘to cause their name (that is, their memory) to live’; and yet, it may have been precisely these actions, deliberate in some cases, which meant that from 1922 onwards, his name would live again, perhaps more so than that of any other figure from ancient Egypt. Numerous investigations were carried out for the project involving specialists from all over the world. We look at the burial equipment and the possibility that the death mask may originally have been made for someone else. We discuss the tomb, which doesn’t match what you would expect of a pharaoh’s final resting place and seems ill-prepared to receive the vast quantity of goods that Carter would find crammed inside it. 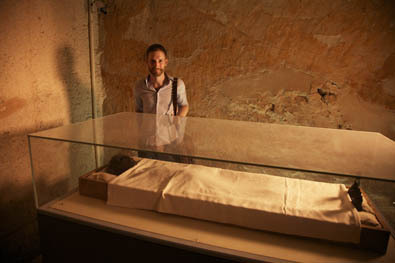 We examine the mummy which suggests that all was not quite right at the time of the king’s death, providing evidence of massive trauma on the left hand side of the torso in particular, that the mummification process was not to have been carried out to very high standards, and that the body may even have been burned somehow. 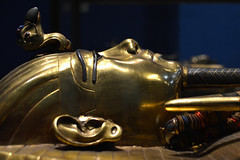 We also examine the efforts made by Tut’s successors to erase his name from the records, and the comprehensive concealment of his tomb by a flash flood, which ensured it avoided the fate of almost all other royal tombs of the period which had been plundered by the end of the New Kingdom. In making the film my colleagues, in particular Producer Laura Jones and Director Sean Smith, and I were very careful not to claim that the theories we advance should be taken as definitive or final. For my part I felt strongly that our job was to provide new ideas, backed up by carefully chosen experts from the right fields, and to take the debate forward. We hope to entertain and we want to get people thinking, but we don’t want to end the debate. What would be the fun in that? Many people have already asked me if we will be publishing the results of the studies commissioned especially for the film and I hope we will, although subjecting the research to ‘peer-review’, the scientific scrutiny that is required to verify the credibility of academic research, across so many diverse disciplines will not be easy. Of course, much of our story also draws on research which has already been published, such as Steve Cross’ flash flood theory which was published by the EES in The Journal of Egyptian Archaeology (JEA 94 (2008)), as ‘The hydrology of the Valley of the Kings’. It is very important that we try to publish the rest of the story as well. Television is a vital part of Egyptological discourse and when a film like this generates new ideas and interpretations, or means of presenting them, they should be captured and added to sum total of knowledge in the field in the same way as published books and articles are. I have discussed before the problem of a ‘disconnect’ between academic Egyptology and what you might call ‘public Egyptology’ – on television in particular (see here). I feel very strongly that those of us on the inside have a duty to share with the public both our knowledge of ancient Egypt but also how we as a discipline came to acquire that knowledge. This is one of the essences of what we are trying to do at the Egypt Exploration Society (EES) by providing a bridge between scholars and the public. * Just as we must share our ideas, there should be a way of ensuring that the efforts of television companies can be made available to the academic world. I believe that cultivating good relations between Egyptologists and the media will help to address this problem. I’ve been thinking about how much fun the shoot was but I think that rather than providing a very long, diary-style account (as I did in a fit of excitement around the time my last documentary was broadcast, see here) I’ll post a few more behind-the-scenes photos like the ones above over the next few days, with a few notes explaining what made the experience so special. I really hope those of you who see the film enjoy it. I hope you’ll find something new in it and that it gets you thinking. If the film achieves all that I’ll be pretty satisfied that we’ve done what we set out to do. *Cultivating relations with the media, and with the television industry in particular, has been an important part of our strategy for raising the Society’s public profile for some time now. Getting the Society’s name ‘out there’ by showing staff like myself and others to be taking the lead in delivering cutting edge Egyptology to the public is a vital means for us to build credibility and recognition. The EES is on a mission to help preserve and share knowledge about Egypt’s past and we need the public’s support to do this. If you would like to help, we’d love you to get involved by becoming a member or making a donation. Thanks! How should we define ‘Egyptologist’?